There always has to be a tradeoff, right? You can have it fast, but it’s going to cost you. You can see guaranteed results, but you’re going to have to be patient. You’ll get more administrative control, but it will result in additional complexity. With PrinterLogic, there’s no but—only and: Powerful, efficient print management and reduced server infrastructure and rapid return on investment (ROI). That’s what more and more of our customers are discovering, as continued studies by TechValidate have shown. Since implementing PrinterLogic, hundreds of organizations surveyed by this independent research firm stated that they’ve been able to eliminate their former print servers (along with the attendant costs) while reducing time spent on print management to result in a quick ROI of just 12 months or less. 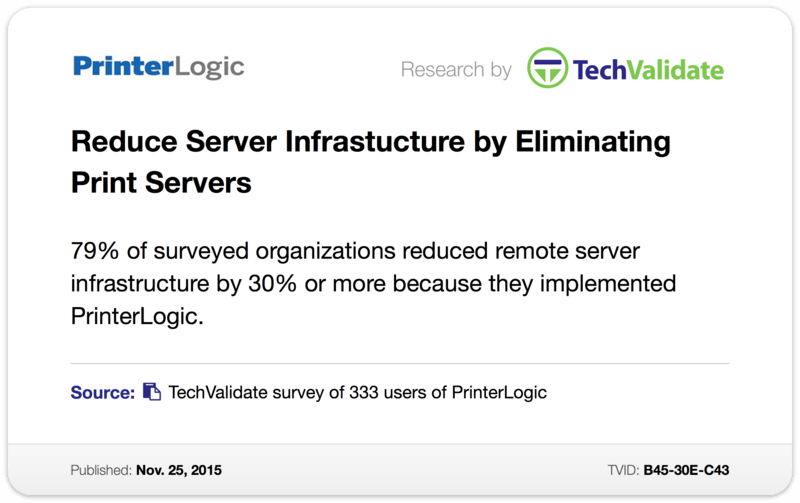 According to one recent survey of 333 users of PrinterLogic (TVID: B45-30E-C43 ), an incredible 79% of the respondents said that they had reduced their organizations’ remote server infrastructure by 30% or more after installing our enterprise print management solution. That roughly equates to eliminating one print server out of every three, on average – and with it the related costs of maintenance, upgrade, migration and replacement. And that reduction in infrastructure also resulted in greater management efficiency. 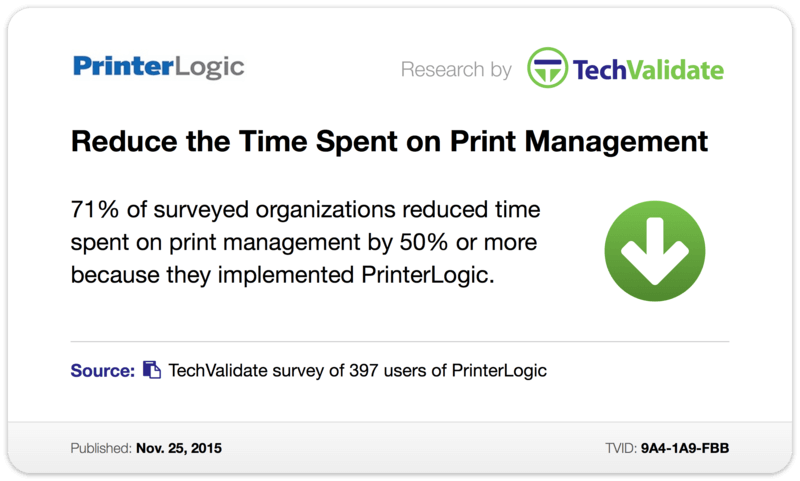 In another recent survey that sampled 397 PrinterLogic users (TVID: 9A4-1A9-FBB ), 71% of the respondents stated that their organizations had slashed time spent on print management by half or even more as a direct result of installing PrinterLogic. In practical terms, that means nearly three out of every four of these organizations now devote less than one hour to print management for every two they used to require. At that rate, imagine the increased productivity and cost savings over a single month! All that time saved and permanently reduced infrastructure amounted to significant cost savings in the form of ROI, as a third survey shows (TVID: C76-7AF-83A ). 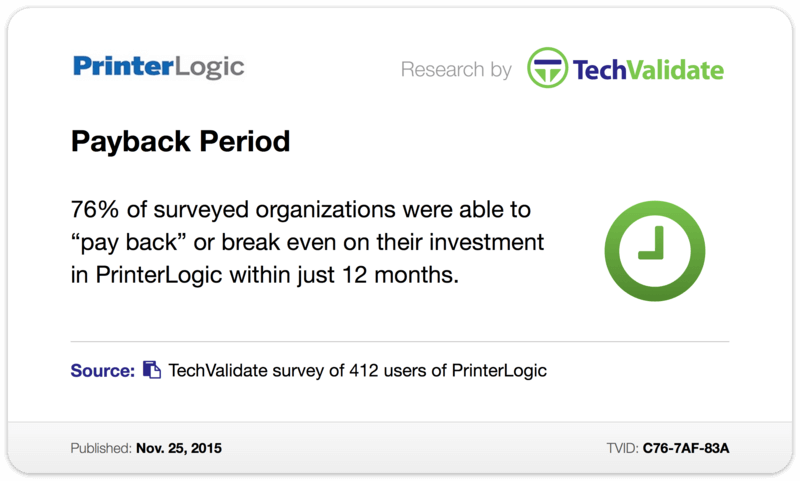 Out of a sample of 412 PrinterLogic customers, more than three-quarters of those surveyed by TechValidate noted that they had been able to break even on their investment in PrinterLogic in just 12 months’ time. That means they saw immediate cost savings. And today, instead of the ongoing costs of print servers, PrinterLogic is continuing to pay for itself several times over. Everything from this point on adds right to their bottom line. What these and all previous TechValidate surveys prove is that PrinterLogic is the enterprise printing solution that successfully delivers on every single count. To reap the benefits of centralized print management and empowered end users, your organization doesn’t have to compromise on cost, oversight, efficiency, security, or any of the other qualities essential to your print environment or your business. Why make concessions when you can have it all?